Rating: A superb new twist on an already-fantastic game. Who Will Like It? If you like the original, you’ll definitely want to take a look. 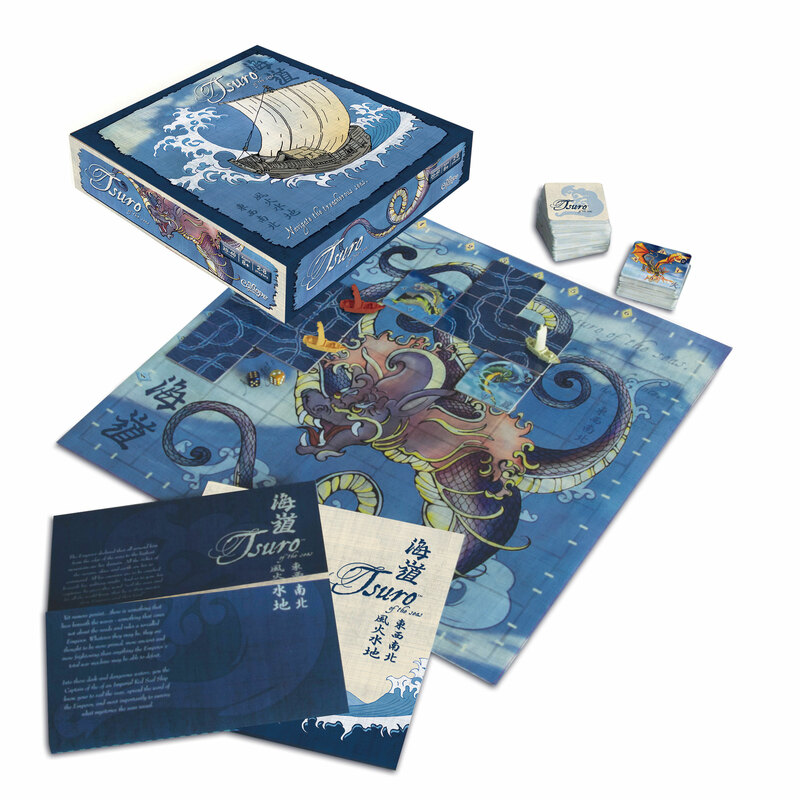 The artwork in Tsuro of the Seas is of the same caliber, and you can even get some prints of the artwork as Kickstarter rewards. The game does throw in a much higher degree of luck, but the seafaring theme and possibility of being eaten by a daikaiju are both a lot of fun. You are captains of an Imperial Red Seal ship, braving the treacherous seas to spread the word of the Emperor. But there are daikaiju out there, so not only do you need to beware of hitting the wrong path, but you’ll also need to steer clear of these ship-destroying beasts. The artwork is all done in a Japanese style that fits the theme, and the tiles are made to look like wakes in the sea. I saw a pre-production prototype at GameStorm so I’ve seen the artwork and a sample of the red ship, but haven’t gotten to see final quality components in person. However, based on the original Tsuro , I would except Calliope Games to use the same quality board and tiles, which were made of a heavy cardboard with rounded corners. The artwork (as you can see from the photos here and on the Kickstarter page) is gorgeous and the little ships look really great. The Tsuro of the Seas board is a 7×7 grid, larger than the original 6×6 grid. Each daikaiju tile has 5 numbers on it, corresponding to the four cardinal directions and a rotation, which are used for movement. The wake tiles have paths on them that connect to two points on each edge of the tile. Unlike the original, there are some repeated tiles in this batch. The wake tiles are shuffled and each player draws a hand of three. Then a number of daikaiju (based on the number of players) is placed face-down on the board, using the dice to determine where they are placed. The coordinates do not appear on the outside ring of squares, so no monsters will appear at the edges of the board, though they may travel there later. Once the daikaiju are placed, each player chooses a starting spot for their ship. Roll to see if daikaiju move. Move along the wake tile path. Draw a new wake tile. If a 6, 7, or 8 is rolled, the daikaiju will move. The player then rolls a single die, and checks each daikaiju to see how it moves. (The daikaiju are numbered to indicate the order that they are moved.) Based on the number rolled, each daikaiju will either rotate 90 degrees, move one space, or stay still. Wherever the daikaiju moves, anything it covers — a wake tile, another daikaiju, a ship — is removed from the game. If you’re still alive after the daikaiju move, then you place a wake tile in front of your own ship, and then follow the path to its end. If the tile extends the path of any of the other ships on the board, they move as well until they reach the end of their respective paths. Any ship that goes off the edge of the board or moves into the space with a daikaiju is eliminated from the game. Finally, if after all of that you’re still alive, then you draw a new tile and play passes to the next player. You win the game if you’re the last player remaining on the board. If two or more players exit the board on the last turn of the game, they share the victory. Optionally, you can play Tsuro of the Seas without the daikaiju — it’s not exactly the same as the original Tsuro because of the larger board and some repeated tiles, but it would be a fairly similar experience. As I mentioned earlier, I got to play a prototype of Tsuro of the Seas at GameStorm this year, and I’m really excited for its release. The original was on our Best Board Games of 2011 list, and you may have seen it on Wil Wheaton’s TableTop as well. The addition of the daikaiju makes for some interesting changes to the game. For one, there’s just the random luck element as you move around — you don’t know whether any nearby monsters might move toward you before you get another turn, so you have to take your chances to pick a direction. But another significant effect which you may have missed just from a read-through of the rules is that because the daikaiju eliminate wake tiles, they clear more room for movement. In the original, if two players run into each other, they are both eliminated — because if you follow the paths, they’ll both end up off the board where the other player started. In Tsuro of the Seas , this may not be the case. Following the path somebody came from may put you in the middle of the board somewhere because the paths can get broken up by the daikaiju. There definitely is a higher luck factor in Tsuro of the Seas , but it can make for a very fun experience, not knowing where the monsters are going to move next. You do need to check the rules carefully about when players are eliminated by monsters, but it is still very easy to pick up and play, and you can quickly teach new players. I also love that it’s a game that fits up to 8 players, because there aren’t many quick-playing games that can handle that many players at once. 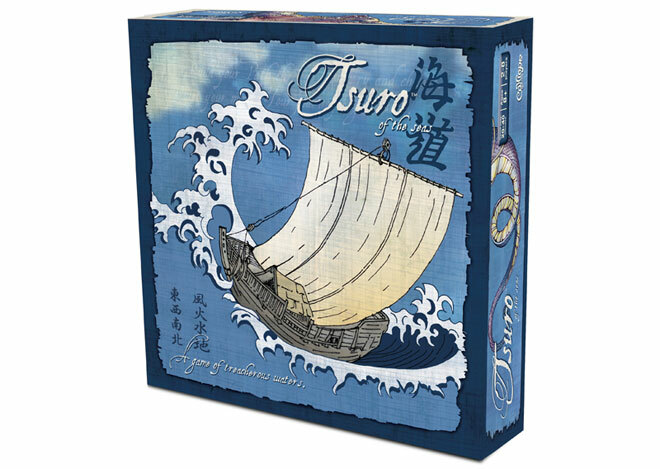 Tsuro of the Seas is slated to be launched in August this year at GenCon, but Calliope Games is hoping to use Kickstarter to build up buzz and convince retailers to stock the game once it’s released. If you back it now, you’ll find a lot of cool swag (including prints of the artwork from the game). Whether you kick in for a copy now or wait for its release, I highly recommend picking up a copy of Tsuro of the Seas . Wired: Giant monsters, cool Japanese ship pawns, beautiful artwork — not to mention a fun game. Tired: Not all players will like the luck factor, but they can play without the monsters.